This pretty bracelet is made in 14kt white gold. It is set with 299 diamonds in total including 36 tappers and 263 round. The total diamond carat weight is around 1.70ct. It is a very cute and delicate bracelet. Heritagem presents :This beautiful bracelet is a real testimony of the Art Nouveau period : it is made in 18kt gold with two differents tones : rose and yellow. The links are in rose gold and the twisted links are in yellow gold. It is a timeless design and very easy to wear everyday. It is secured with a chain. The clasp was fully hallmarked twice with the 2 eagle's heads and there is also the rhinoceros' head. We can also see the maker's mark however it is quite hard to read. It weighs 27,9 gr and it measures 21 cm long with an approximate diameter of 7cm (2,75′). It could fit for a M wrist but it could be adjusted for a S wrist, feel free to ask we will be happy to do it for you.It was made during the Art Nouveau period, in the very beginning of the 20th Century. Art Nouveau is an artistic movement applied to the decorative arts, featured with a predominant theme : the free flowing line. Artists tried to find movement into woman’s hair, feminine curve and naturalist images.All our items come with either a gemological report or a jewellery report with circa and all useful information. Heritagem presents :A stunning set composed with 3 victorian bangles. Each bangle were perfectly handcrafted into 18kt gold. They have a beautiful cluster design. One is set with a deep blue Ceylon sapphire weighing approximately 1,40ct, with no indication of treatment / heating. The second one is set with a ruby from Burmese with no indications of treatment and it weighs around 1ct. And the third one is set with a white pinky pearl tested as natural. They all have a diameter of 7.42 x 7.25 mm. The gemstones are beautiful surrounded with 10 rose cut diamonds and the shoulders of the bangles are also adorned with roses. There is an approximate total carat weight of 4ct for the diamonds. The bangles are in very good condition. They were made during the Victorian era in France circa 1880. Each of them was controlled twice the eagle's head and once with the maker's mark on the strap : B & L. They are secured with a security chain. They weigh 17,7gr each and have the same inner diameter : 52,97 (2) x 45,39 (1,78). The central flower is 14,97 (0,58) mm of diameter. They could fit for a small wrist.This bangles were beautifully made they are completely characteristic of the Victorian jewellery period.All our items come with either a gemological report or a jewellery report with circa and all useful information. Heritagem presents :An adjustable black bracelet. This one features a heart adorned with brilliant cut diamonds. The lovely motif is set on 18kt white gold. 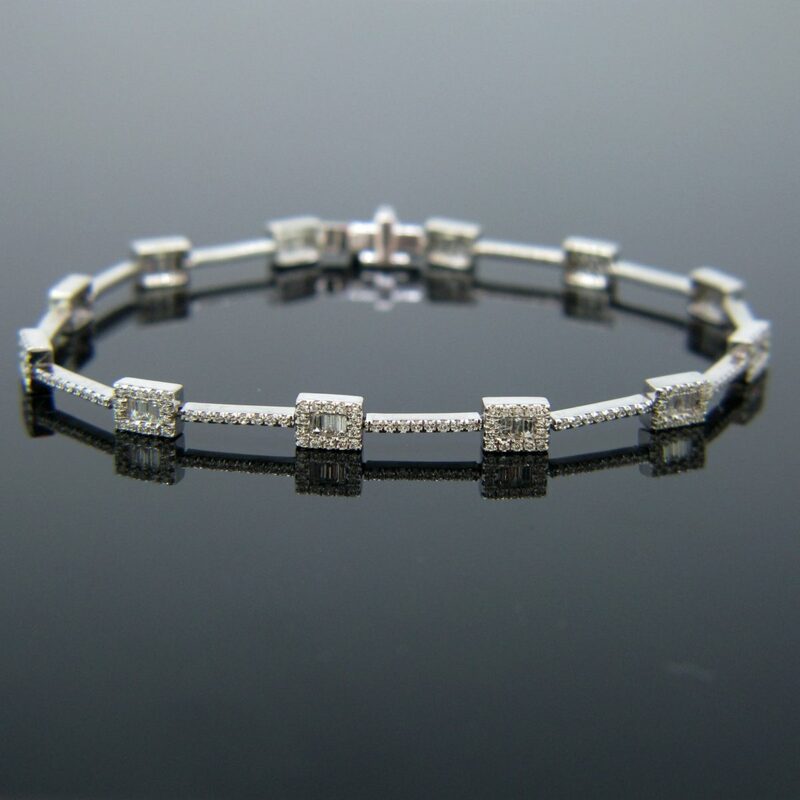 This bracelet is very easy to wear every day and could be the perfect present to celebrate your love. Heritagem presents:This bracelet comprises of 13 links adorned with natural gemstones: rubies, sapphires, emeralds and diamonds : the most famous precious gems. The diamonds are set on platinum. The links are in 18kt yellow gold. It was controlled with the French rhinoceros’ head. It is very good antique condition. 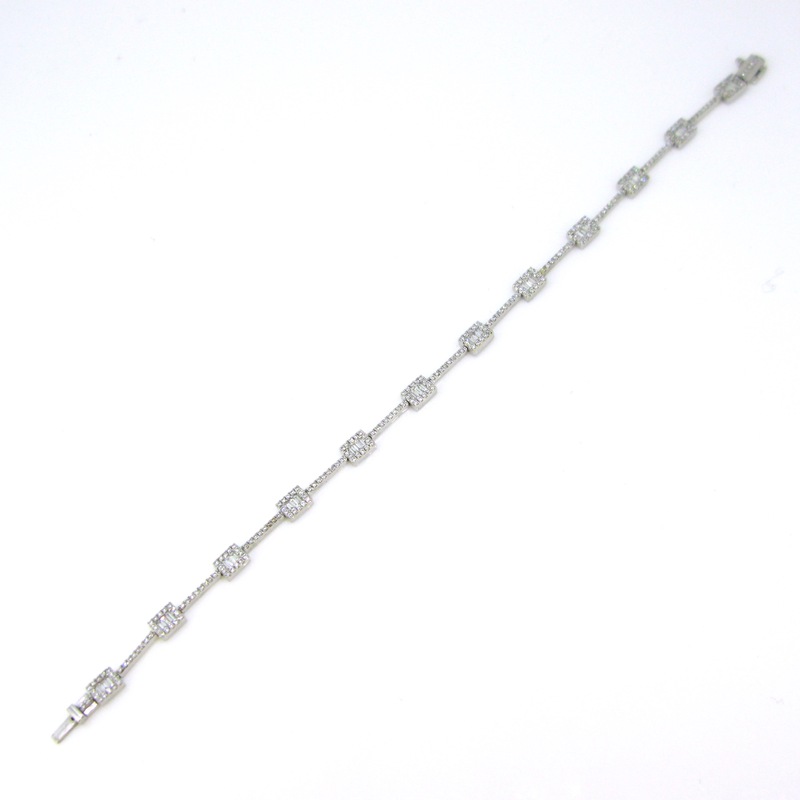 The bracelet could be resized.All our items come with either a gemmological report or a jewellery report with circa and all useful information. Heritagem presents :An authentic women’s CHOPARD bracelet. This Happy Diamond model is finely crafted from solid 18k yellow gold. 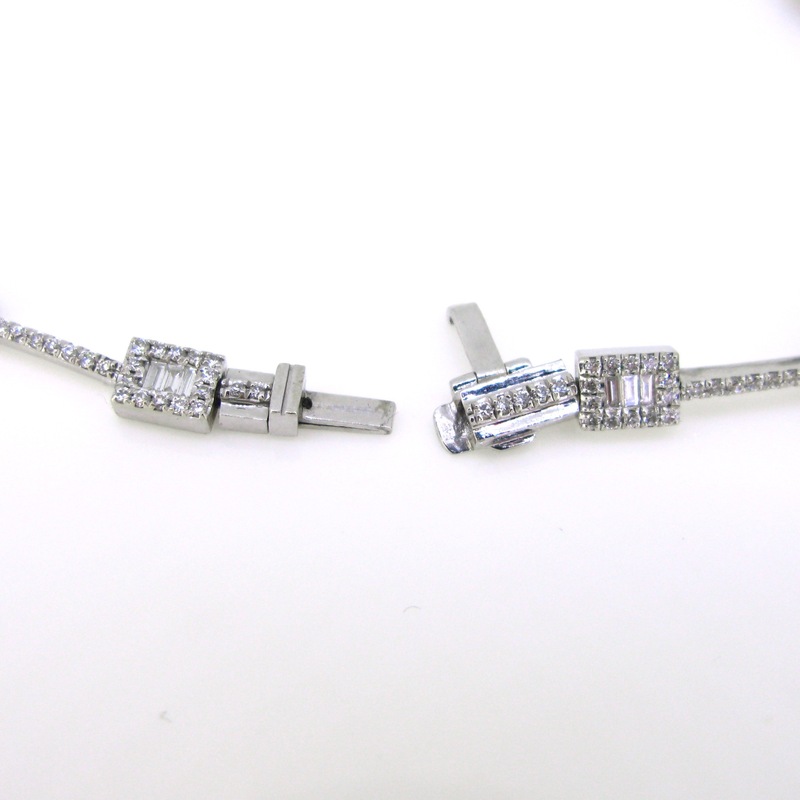 This exquisite one is highlighted by 3 stations links each contained with 3 floating diamonds. They weight around 0,05ct each. The central one was engraved with the name of the famous house. They are surrounded with brilliant cut diamonds and framed on each corner with cabochon cut rubies. The bracelet provides elegance. It is signed on the clasp and controlled with the Swiss hallmark. It could be adjusted to your wrist. It was engraved with the number 1856. Heritagem presents :This beautifuf bangle is ravishing. It is magnified in its center with a shamrock set with 3 old mine cut diamonds (tcw : 1,80ct approximately). The shoulders of the bangle are nicely adorned with 12 old mine cut diamonds for a total weighing approximately 1,50ct they are quite lively and sparkly. There is a total of 3.30ct for the diamonds. . The bracelet was perfectly handcrafted in France in 18kt rose gold and platinum at the very beginning of the 20th century. It closes firmly with a snap and it is secured with a small hook. The strap was marked twice with the Rhinoceros' and the eagle's head. We can also see clearly the maker's mark : C | B..The bangle weighs 27,5 gr and measures 6 ,4 cm x 5,8 cm x 1,6 cm / 2,5 ' x 2,3' . It is in very good antique condition. The rose gold is smooth and shiny. The clover or shamrock is associated with luck and chance.All our items come with either a gemological report or a jewellery report with circa and all useful information. 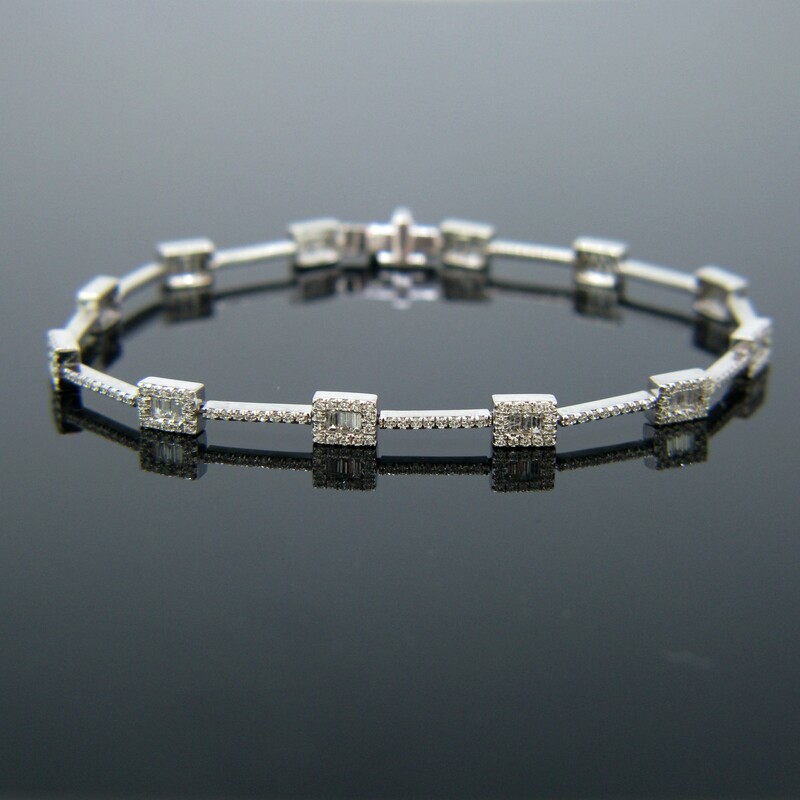 A beautiful modern bracelet. This one is made in 18kt yellow gold and it is adorned with 10 brilliant cut diamonds for an approximate total carat weight of 0,50ct. The links are made with twisted wires gold. It goes perfectly with one of our ring which has exactly the same design. 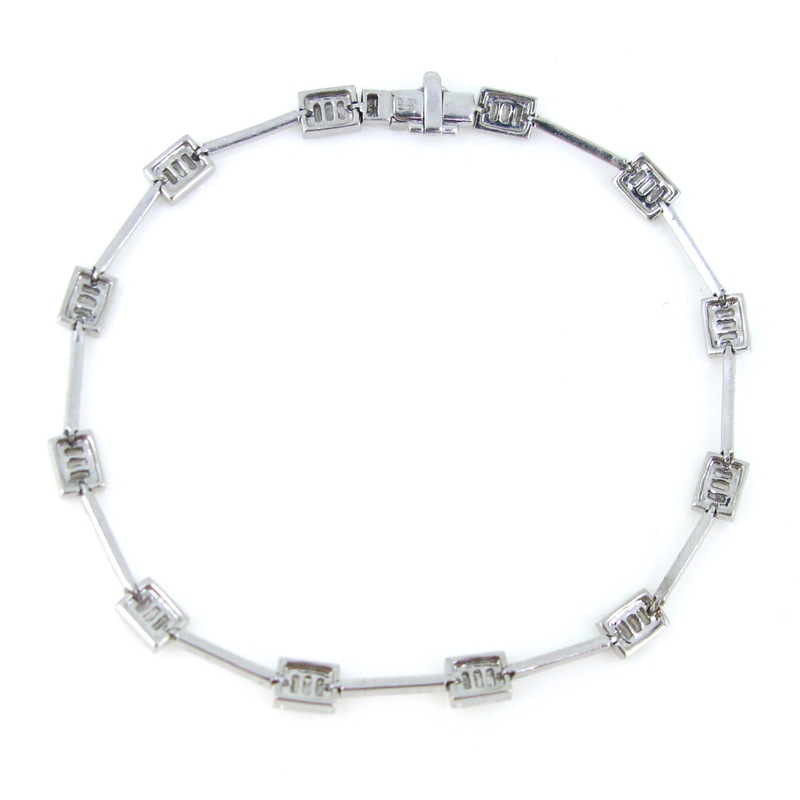 The bracelet is trendy and quite easy to wear everyday. Heritagem presents : A masterpiece of the Art Deco period. This bracelet features a deep blue sapphires line into 2 line of 8/8 cut diamonds. The 40 sapphires have the French cut : the French cut was invented during the 15th century and become extremely popular under the Art Déco period, specially in France where it was mostly used and that's why we call it the French cut. They weigh around 9 ct. There are 160 diamonds for an approximate total carat weight of 4,8ct. 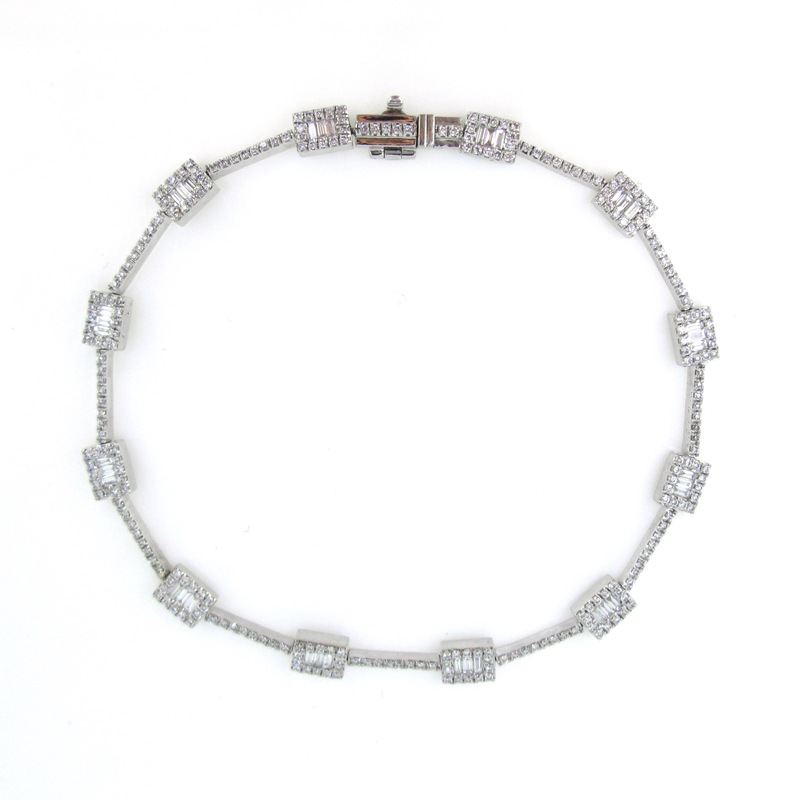 The bracelet is a real testimony of the Art Deco period. The rims of the bracelet are beautifully engraved with flowery motifs. The strap closes firmly with a snap and it was controlled with the dog's head, the French hallmark for platinum. 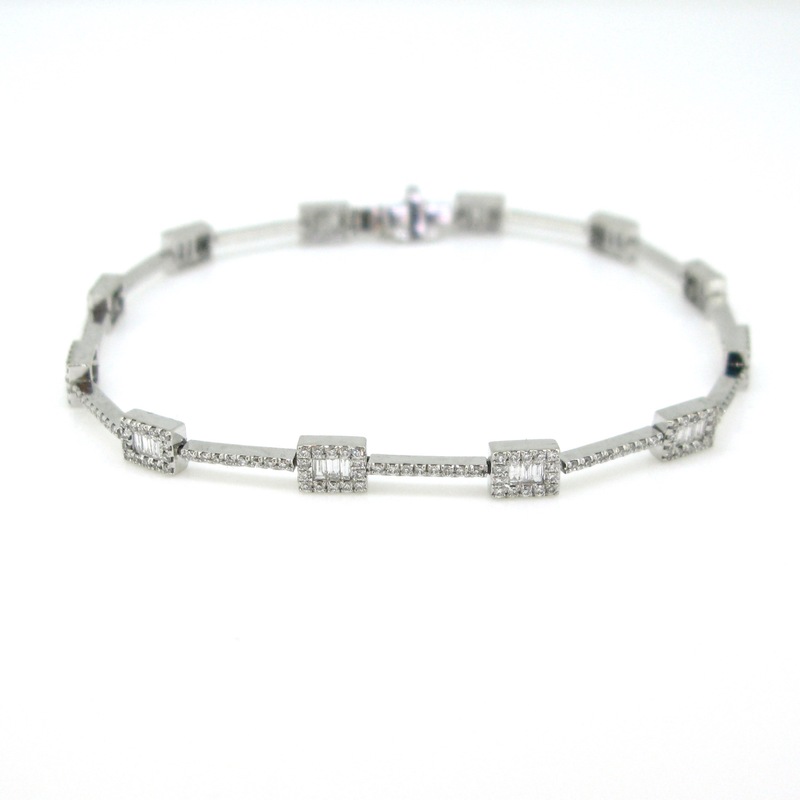 The bracelet weighs 29,7gr and it measures 17cm long and 1cm large in the middle of the bracelet.If you are a lover of art deco pieces, this timeless bracelet is for you ! All our items come with either a gemological report or a jewellery report with circa and all useful information. Heritagem presents : A ravishing green garnets and diamonds bracelet. This one is set in the center with 6 tsavorites, interspersed with diamonds. The tsavorite is a green garnet that we find in Africa. Its name comes from the Park Tsavo in Kenya. The green garnet was discovered in 1974. It has a beautiful deep green colored, closed to the emerald color that's why it is the garnet the most used in jewellery. Here we have 6 oval cut tsavorites weighing approximately 0,40ct each. We have 10 diamonds (tcw : 0,20ct approximately). The bracelet was made in 18kt gold. The links are smooth and smashy. 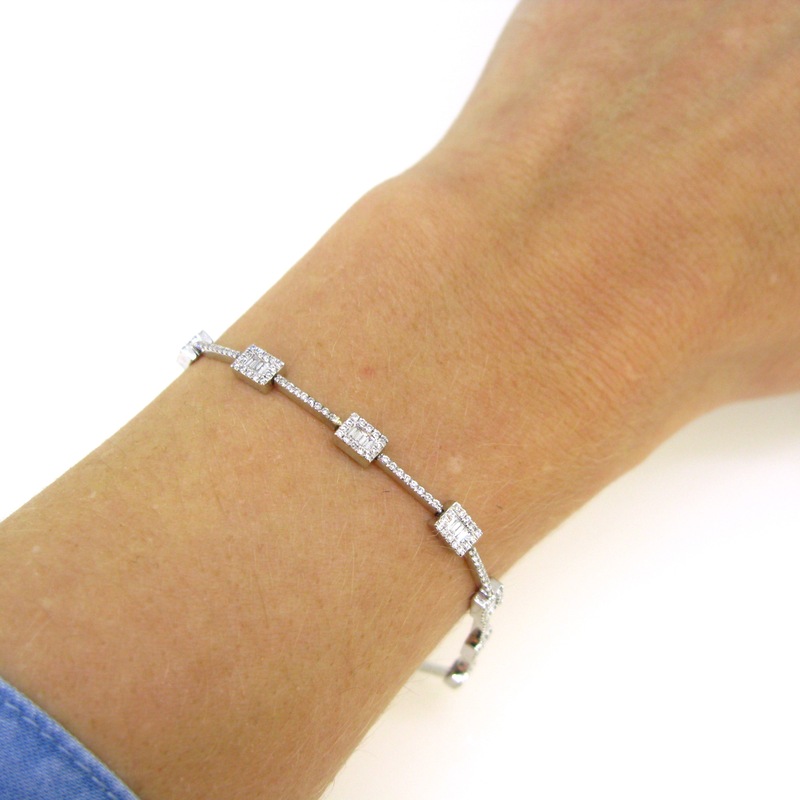 This bracelet is very easy to wear every day. 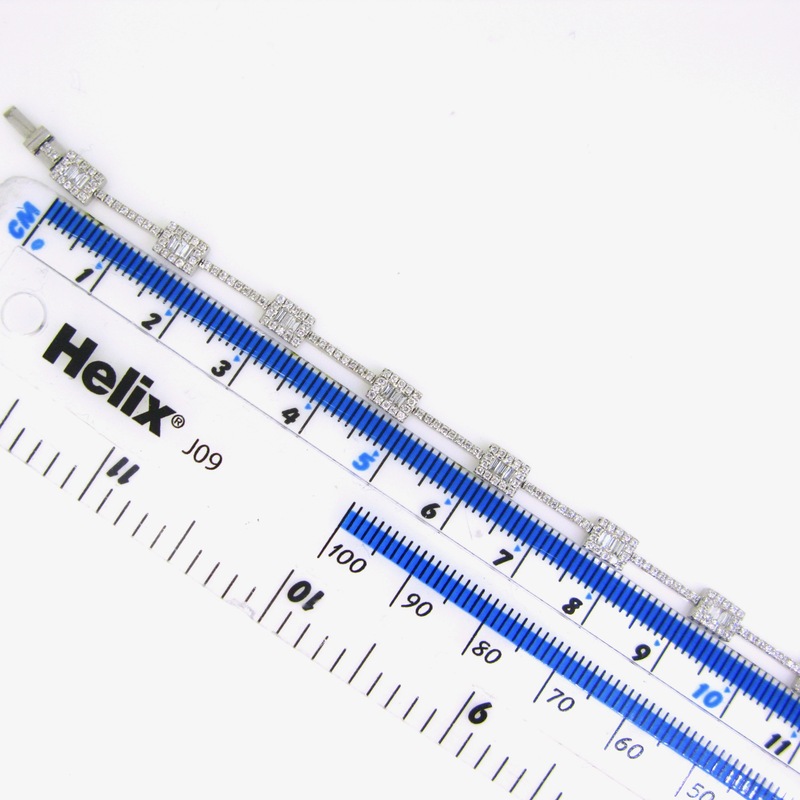 It measures 18,5cm long and could be adjusted. It closes firmly and it is secured with 2 straps. It was controlled with the UK hallmarks.If green if your color, this bracelet is for you ! Garnets celebrates the second year of marriage. All our items come with either a gemological report or a jewellery report with circa and all useful information. Heritagem presents :An adjustable blue bracelet. This one features a rose cut blue topaz surrounded with brilliant cut diamonds. The lovely gemstone is set on 18kt white gold. The blue topaz celebrates the 4th anniversary and it helps communication. 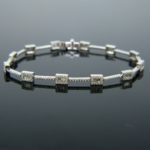 This bracelet is very easy to wear every day and could be the perfect present to celebrate your love. It matches perfectly with the pink quartz bracelet.